Rosewood Naturals Cornflower and Daisy Sticks are 100% natural, boasting a delicious blend of herbs, vegetables and seeds. These yummy snacks have been baked to perfection and coated in edible cornflower and daisy flowers for extra goodness. 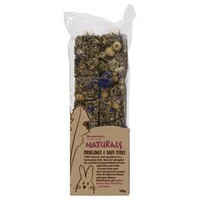 Boredom Breaker Naturals Cornflower and Daisy Sticks are loved by all rabbits, guinea pigs, chinchillas and degus. Made from 100% grain free beneficial herbs, vegetables and seeds with a natural cotton hanger.